Caving’s a funny old game. When you get to my age its difficult remembering when was the last time you had a young lady’s legs wrapped around your neck, so if anyone has said to me that it would happen during a caving trip to Northern Lights in OFD, I wouldn’t have believed them. 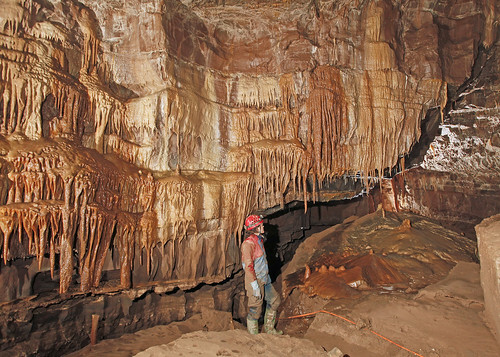 How could this possibly happen on a caving trip, do I hear you ask? Well with three keen cavers ‘champing at the bit’ (excluding Brendan and me) and lots of ‘please, please take us caving’, eventually after several hours of faffing on the Thursday evening preceding the trip and at about eleven o’clock when everyone else had gone home we finally made the decision to tackle Northern Lights in OFD. The problem as always when Mark is on a trip is, ‘Would he fit through the tight squeezes en route to our chosen destination?’ As it turned out Mark had no problems with even with the tightest squeezes – this time it was Jessica’s turn to mess things up! There is a rope climb up to Mudlust Hall with an awkward manoeuvre at the top requiring one to post oneself horizontally into a slot at the top. Mark went up first without problems. When it was Jessica’s turn I volunteered to climb up below her to offer some protection should she slip – an offer which she readily accepted. She climbed well but found the ‘awkward manoeuvre’ at the top more than a little awkward and after a little while trying to thrutch her way into the slot realised she was tackling it at the wrong angle and said that she needed to come back down. I tried to guide her feet to the foot holds in the rock, but without success so I grabbed her knee to prevent her falling. After this, what happened next was like playing a vertical game of Twister and I started to think how a court case for sexual harassment might play out. Raucous laughter from below brought me back to reality. Fortunately Brendan’s camera was still safely stowed away in its box and boyfriend Mark was out of sight at the top of the pitch. Jessica had another attempt at the pitch and this time climbed up safely, and the rest of the trip was concluded without further incident. 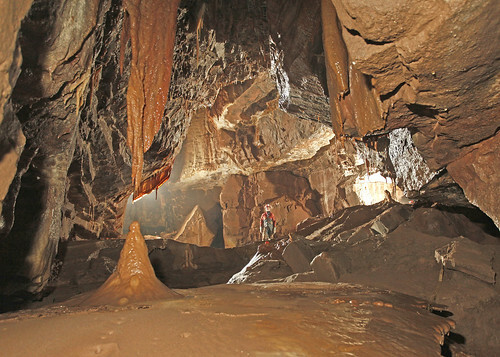 We managed to complete all of the passages in this area of the cave and Brendan took some stunning photos in Mudlust Hall.